If you're like most women in America you have a lot a TON of makeup! We all store it in different places. around in my makeup bags. I've ever made! HERE is where I found my inspiration. 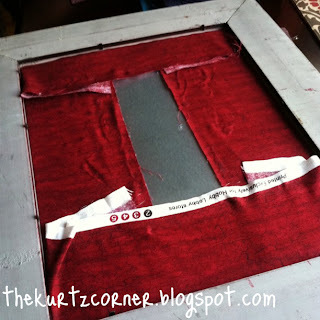 Start by removing the backing and the glass from your picture frame. You'll want to use the backing to measure and cut your metal sheet to fit into the back of your frame. You will need metal cutting shears for this part. After you have measured and cut your metal sheets wrap it with the fabric of your choice. Make sure it is taut and secure it with hot glue. Your frame is now done! Next, start gluing magnets to the back of your makeup. Once the makeup is all used up simply pull the magnet off and peel off the hot glue from the magnet and reuse them. Use your additional fabric to wrap your cup. You will use this for all of your brushes, mascara, eyeliner and tweezers. 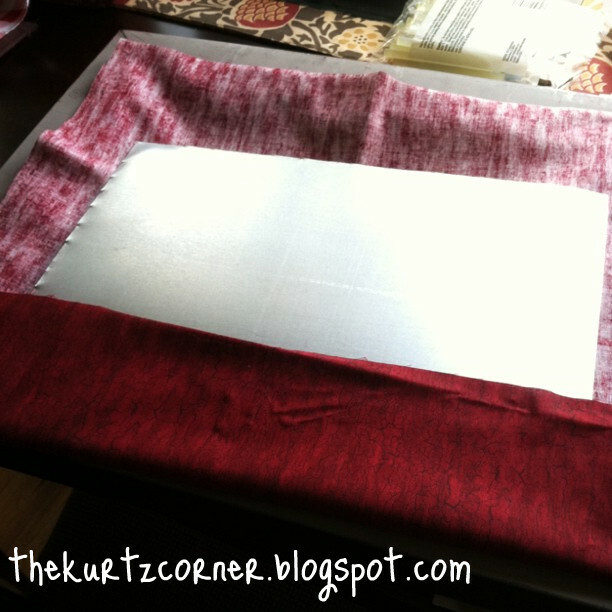 Make sure you use a light cup (I used a baking powder can) and then line the back with 3 to 4 magnets. Arrange all of your makeup on your new makeup board and you're ready to hang it in your bathroom! The finished product!! Isn't it awesome!? Great project ... I've been looking for a classy way to do something like that! This would work ... very nicely done. Thanks for sharing. This is so cute! I know what you mean about digging in a makeup bag with loose makeup all over, not fun. I have been trying to find something creative and this is perfect! Love it, thanks for sharing. This is so cute and I love it!!! Thanks everyone! :) It was such an easy project and one of my favorite so far too! Very useful! Ohhh...how cute and clever!!! I have never seen this done...and think that it's a GRAND idea for storing and keeping makeup "ready for use"! 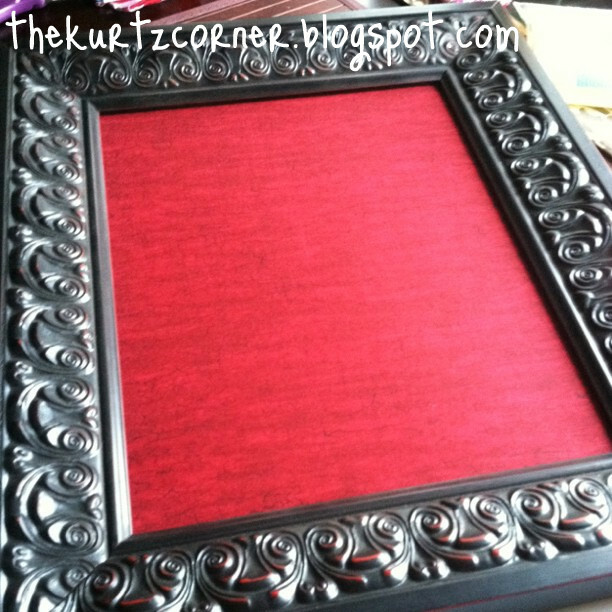 Love the frame and beautiful red fabric that you used...very pretty! Love, love, LOVE this craft idea! Thank you so much for sharing it with us for the Sunday Favorites repost party this week! what a great idea!!! why didn't i think of it before!! It would definitely solve the mess on my bathroom counter! 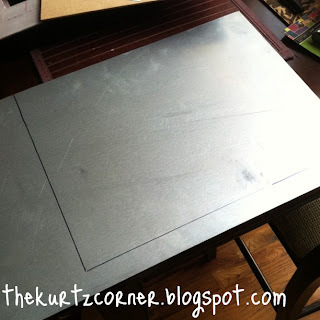 :) I just stumbled upon your blog from "the girl creative!" and i'm so glad I did, because i'm hooked!!! I am your newest follower!!! BTW...your wedding dress is gorgeous!!!!!! @Chari - It is super convenient in the morning! My husband and I live in an apartment and we have a tiny bathroom with minimal counter space so just having one makeup item out and then turning around to get the next one really reduces the clutter!! Thanks for stopping by! @Jess - Thanks for following me!! I hope you come back on a regular basis. I have lots of fun crafts in store! :) Oh, and thank you, I loved my wedding dress! I wish I could wear it all the time haha...I actually thought about turning it into a cocktail dress so that I could wear it somewhere fancy on an anniversary trip or something! OH MY GOODNESS! I am on a tight budget so am always looking for gifts to make for my college daughters . . . this will definitely be something I'll be making for them for Christmas! Thanks for an adorable and practical idea! I'm so glad you made your own version! I can't believe how popular it's been, I've loved seeing others popping up all over the place. I have not seen this idea anywhere and that is a hard commend to come by in the blog-o-sphere! Well done. I am absolutely copying this idea for my eye shadows. :) Thanks for the inspiration! 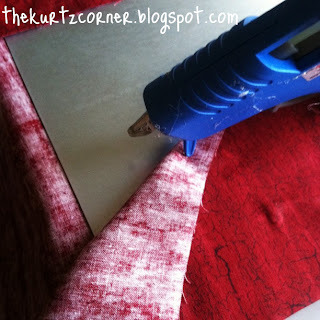 Will you stop by my HomeMade Monday blog party next week at HomeSavvyAtoZ.com to share? Looking forward to blogging with you! @Erin - I will for sure stop by and share next Monday! I'll add you to my "Party Over Here" list! Audra!! This is adorable! Loove finding crafty creations like this! What a great idea. 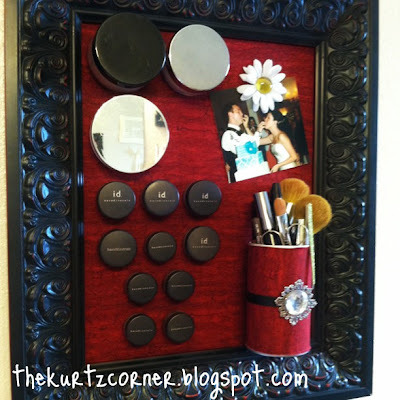 I have a metal cabinet already so all I need are a few magnets to put on my make up containers. Brilliant and so much better than the drawer thing I have going on, thanks for sharing! This is the coolest thing ever! Great, great idea. Thank you for sharing it. WOW! I am in love with this idea! Can't wait to make one for my bathroom, craft room, kitchen... Thanks for the great idea!!! @Danielle - Absolutely! I'll head over there now! I've been meaning to do one of these! Thanks for sharing and showing! Come on over and see my son's vintage room! Great idea organizing your makeup!! This is a great idea...and you made it yours, whether you were the first to do or not. Yours is very, very pretty. Thanks for the step-by-step. You are featured at Anti-Procrastination Tuesday! Thank you so much for linking up!! I just wanted to let you know I will be featuring you tomorrow. Stop by and grab a button! This is so practical for a small house like mine. So stinking smart and clever -- I am definitely doing this!! You're a List Maker! Stop by and grab a button when you get a chance! hope you can pop by my blog as well. Looks fantastic! Thanks for auditioning for American Crafter! This is amazing! I'm going to do this for sure. LOVE this idea. Thank you! Now I hope i can find an extra large frame! Its interesting project,like these creative ideas. I just read your blog and found it very interesting to see your ideas. I found this website which might be helpful for some of your make-at-home crafts. Take a look at www.mag-print.co.uk to see if they have anything which is of any use to you in your craft activities. Nail Art - Starting a New Trend!